The wellness approach to a more balanced lifestyle is a trend that has taken over social media and health discussions in recent years. Countless health-related outlets promote “wellness” as being the most effective and positively advocated method to look after ourselves both mentally and physically — from Instagram pages to magazine articles, the way we feel is being prioritized more than ever before. The Golden Mean Wellness Shoppe & Healthcare Clinic located on King St. West, was opened two years ago with a vision focussed on evidence-based health services and wellness-related products that target a variety of different needs. The space is relaxed and aesthetically decorated, making you feel calm and at ease when you step into the welcoming storefront. 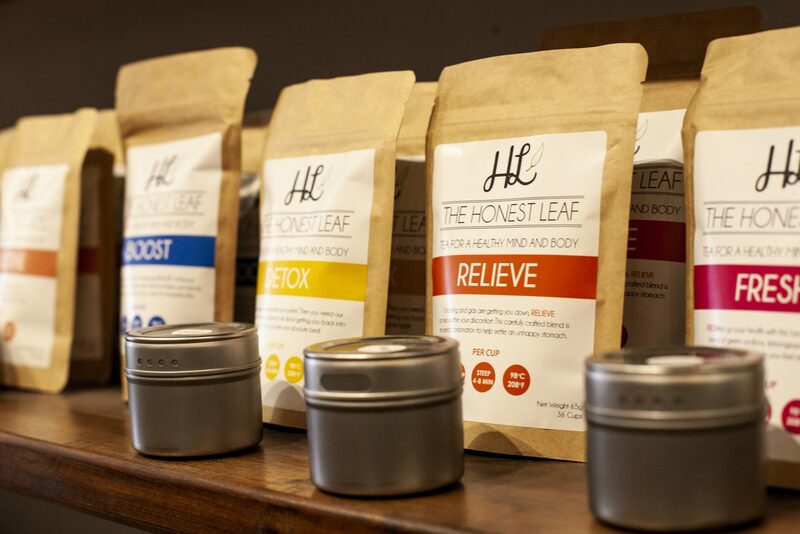 They have a selection of lifestyle and health-based products for sale such as balms, essential oils, supplements and small gifts, as well as smoothies that are made and sold behind the counter during the summer months, transitioning into teas, coffee and kombucha for the winter. There is a team of professional healthcare workers available for different purposes, which is an aspect that is continuing to grow. Currently, Golden Mean offers naturopathy, Reiki, chiropractic and massage therapy services, with plans of bringing in a social worker as well. Holly Bradich is the manager and nutritionist of the store, with a Bachelor of Applied Science in Nutrition from the University of Guelph and a Bachelor of Arts in Psychology from the University of Waterloo. She has an allopathic approach to nutrition and strongly believes in balance and moderation when it comes to diet, regarding wellness as a more comprehensive mentality that should be applied to all aspects of everyday life. “Unfortunately there is a lot of stuff on the internet that’s not science-based and we are very science-based, especially our naturopath. I think she gets frustrated because there are some naturopaths out there — that even though they’re trained rigorously in scientific methods — some of them divert into different streams that aren’t science-based and it makes the other naturopaths look bad,” she said. “I believe in optimum wellness. Really feeling your best physically, mentally, energetically. I think the Western model just defines it as the absence of disease, but I don’t really agree with that. I think most people now are trying to reach a more optimal, functioning level and just feeling their best everyday,” Bradich said. For students especially, wellness can seem like an overwhelming method to apply to their busy lives in order to be more healthy with their habits — but it doesn’t have to be. The key is realizing that it’s not “quick fix” but a way of tackling your day-to-day routine in order to help you feel better overall. “Taking on enough time for your mental health and managing stress and getting your sleep. Kind of like a whole lifestyle [approach] and not just like a ‘I’m gonna go on a fad cleanse,’” Bradich said. In terms of how popular the wellness approach has become, Bradich sees this as a positive transition. “I think people are taking a more preventative approach to healthcare because there’s going to be such a strain with all of the boomers aging,” Bradich said. Educating yourself properly is imperative in knowing how to approach wellness and personal healthcare most effectively. “I would hope that university students have the research skills to know when they’re reading something that’s scientifically sound, but with the general public, if they don’t have continued education, then they may not be able to differentiate psuedo-science from real science,” Bradich said.